New RGV FC Toros coach Gerson Echeverry first met Wilmer Cabrera when they were teammates with Colombian soccer club America de Cali. Echeverry said Cabrera was one of the team’s big dogs — he scored 33 goals in 307 appearances from 1990-97. Echeverry, meanwhile, was with the team for a short stint and only participated in training before being loaned out to a smaller team that would give him a better opportunity for playing time. That was the last they saw of each other for at least 10 years, until a chance meeting in New York. Both coaches were working in the Olympic Development Program, and Cabrera was with a state team in New York while Echeverry was coaching a regional team from his home in New Jersey. “We were on the field, and I looked across and I saw him, and we just kind of met and said, ‘Hey! What’s going on?’” Echeverry said. Knowing Cabrera’s acumen, Echeverry quickly pushed to move him up the coaching ranks. Cabrera first returned the favor in 2008, when he brought Echeverry in to assist him in coaching the U.S. Soccer Federation Under-17 Youth National Team. 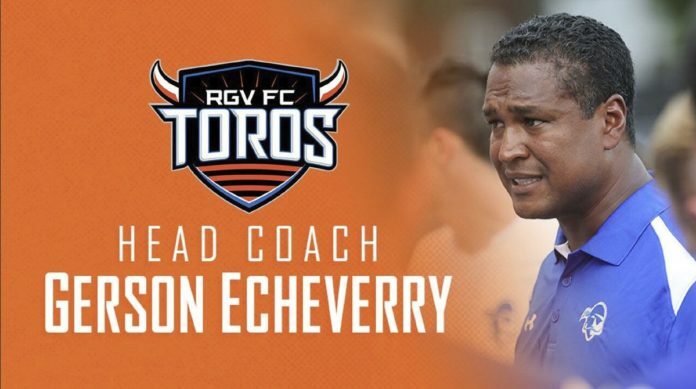 Now the head coach for the Houston Dynamo, Cabrera this week helped Echeverry land yet another position, bringing him into the fold as the new coach of the RGV FC Toros, the Houston Dynamo’s USL affiliate. Cabrera coached the U-17 team from 2007-12, and Echeverry was an assistant from 2008-11. Part of the experience included a residency program in Bradenton, Florida, which allowed their families to develop relationships, as well. Cabrera coached with the Colorado Rapids from 2012-13, Chivas USA in 2014 and the MLS in various capacities in 2015 before starting with the RGV FC Toros in 2016. Echeverry, meanwhile, became the coach at Seton Hall, holding the position from 2012 until he resigned in November. All along, he maintained contact with Cabrera and kept an eye out for any opportunities to take on a role in a professional club, which typically offers more committed players and a greater attention to detail. Echeverry’s familiarity with Cabrera was a factor in the Dynamo’s interest in him, as the organization wanted to select a coach who could facilitate a smooth transition between the MLS Dynamo and their USL affiliate Toros. Echeverry said his style is similar to Cabrera’s — focused on playing compact and maintaining possession. Advancing players from RGV FC to the first-team level is always a primary aim, and Echeverry said he will place equal focus on developing talent and putting a winning group on the pitch for RGV. The roster Echeverry will have at his disposal is largely unknown, as Kowba said the Toros are “almost starting from scratch.” Most of RGV FC’s players were signed to two-year deals prior to the team’s inaugural season in 2016, so the 2018 roster is full of vacancies. Kowba said the organization will look at a mix of Dynamo academy players, college prospects, players with USL experience and talented internationals. The Toros will also pull from a combine in Las Vegas and the MLS combine in Florida before RGV FC camp starts up in late January or early February. In the meantime, Echeverry will be looking to find a new home in the Valley.